After Dubai hotel pickup at about 3pm, hop inside a comfortable, air-conditioned 4x4, and set off on your 6-hour desert experience. Watch as desert sands replace the city’s skyscrapers, and hear about the desert’s ecology from your guide. 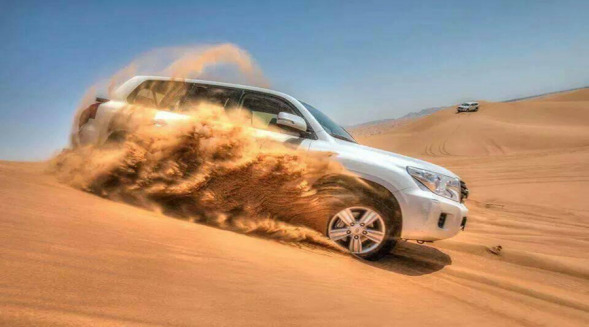 Enjoy a dune bash with a professional driver at the wheel of your 4x4, and visit a camel farm in the sands. See these hardy animals up close and enjoy a camel ride around the enclosures. Next, continue off-road to a desert camp set among rolling dunes. Here, grab a sand board and enjoy surfing down the slopes. Get tips from your guide on mastering your board, and increase your speed as your confidence builds. As the sun sets, relax at the camp, and if you wish, get a henna tattoo on your hands or feet, and puff a shisha (Arabic water pipe). Then, savor a succulent barbecue buffet dinner of classic Arabian dishes like hummus (chickpea dip) and marinated chicken. See the Itinerary for a sample menu. As darkness falls, enjoy a tanoura display featuring whirling dervish-style dancers, plus colorful belly dancing, magic, and fire dancing shows. Your desert experience then concludes with a Dubai hotel drop-off at about 9pm.